Recruiting more than 100 onto post 16 learning provision. Enabling 62 learners to secure employment or apprenticeships following Skills Village training. It is hoped that the visit will encourage the MP to support Northern Regeneration in their bid to receive some of the £29m Construction Skills fund which has recently been announced by the Department of Education to assist in easing the industry’s skills shortage. The funding bid is to enhance the current Eastfield facility. Scarborough Borough Council in partnership with Northern Regeneration has successfully applied for funding to Advantage Coast Community Led Local Development and the York North Yorkshire & East Riding Local Enterprise Partnership, to both extend the skills village site and create a construction business centre on the site of the former High Eastfield Farm. 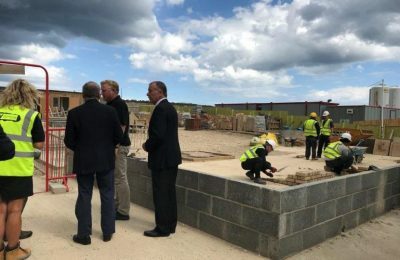 Scarborough Construction Skills Village was established in August 2015 to assist in overcoming the major skills shortages and gaps in skills provision within the construction industry. Training has begun to ensure that a skilled local workforce is available to build the anticipated 9000 new homes that will be required in the Borough of Scarborough by 2032 and help address some of the issues identified in the recent Government Housing White Paper: ‘Fixing our broken housing market’. The Construction Skills Village gives people the opportunity to learn and develop the specific skills required for the construction and housing industries by working on a real life construction site under the guidance of expert mentors. In its relatively short existence, the initiative has already produced some real success stories. The site provides a one stop shop for construction and housing employers, learners, parents, adults and referral agents wishing to understand how to access the industry and recruit locally. “We are delighted that the MP has taken time out of his very busy schedule to come along and have a look at this superb facility. We really hope that the visit will result in increasing awareness of the project and its successes within Westminster and encourage ministers to support any future funding applications for further development”. If you want to get involved with the Construction Skills Village get in touch with the team on 01723 585009.